Staffed by experienced ophthalmologists, Minamiaoyama Eye Clinic Tokyo offers not only LASIK and other refractive surgeries, but also the examination and treatment of dry eyes, allergic conjunctivitis, corneal diseases, cataract, refractive abnormalities (nearsightedness, farsightedness or astigmatism), presbyopia, eyestrain and other ophthalmic disorders. We'll examine and give you a prescription for new glasses or contact lens. Please feel free to talk to us regarding any problem you may have with your eyes. 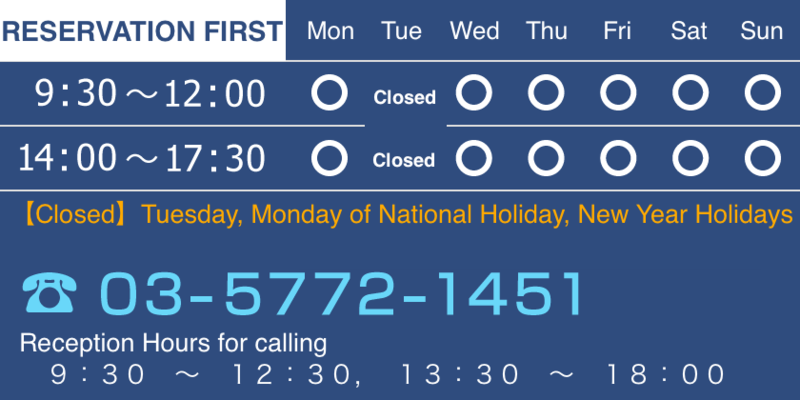 ※We see patients on an appointment-only basis. Please call in advance to make your appointment before coming in. ※ For those enrolled in Japan's public medical insurance (National Health Insurance or Social Insurance plans), please make sure to bring your insurance card with you on your visits. ※ For general ophthalmic care appointments, please call the telephone number below. 12:30 to 13:30, we have stopped the telephone receptionist. For the smooth guidance, please print out and fill the registration form below. Please click below for the registration form.